A beautifully trimmed Cocker is feast for your eyes! 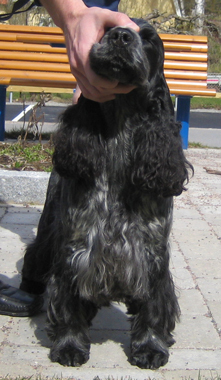 Here I will try to describe how to trim a Cocker correctly, leaving that long lasting natural look. 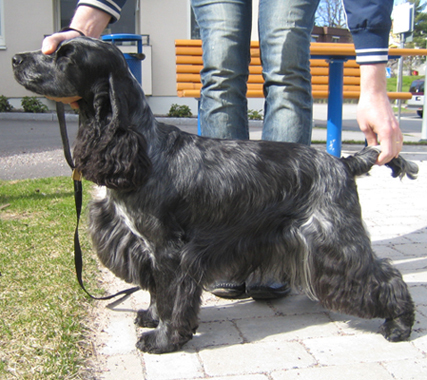 Contrary to what some of these so called »pros« claim, you cannot trim a Cocker in one hour - it's NOT possible! NB! Coat Kings and stripping knives have no part in the correct trimming of a Cocker! Handstripping is without doubt the best way to obtain a smooth, shiny coat which will also stay this way and not alter the texture of the coat. Although it is time consuming the result will be long lasting, which is why I recommend it especially for pets. Since dead hairs are removed from the hair follicle in the process, and not just cut, this will stimulate new hair growth and rejuvinate the coat. Be kind to your fingers and use rubber thimbles (which can be bought in Office supplies stores). Start by pushing the hair against the grain. Any long and woolly hairs will now be visible. Pinch a small tuft with finger and thumb and pull them out with the grain. 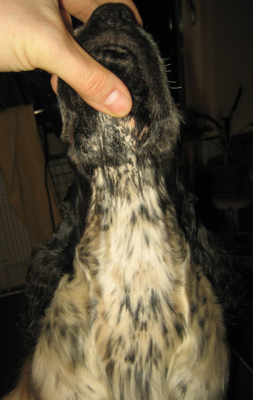 Use your other hand to keep the dog's skin stretched to avoid causing pain. Beware not to stay too long in one place or you will end up with a bald spot. The aim is a smooth and even finish. Remember: ALWAYS handstrip a dirty coat, never a squeaky clean one, as you will get a much better grip that way! Begin by stripping the head by hand, starting at the stop and working your way back over the scull and down the sides towards the ears. Remember, you want to take away all the fluff and long hairs, leaving a short-haired smooth looking head. If the muzzle is very hairy, strip this too but be careful not to pull out the whiskers (these are cut short with straight scissors). Eyelashes and eyebrows are also removed using scissors pointed away from the eyes and skin. 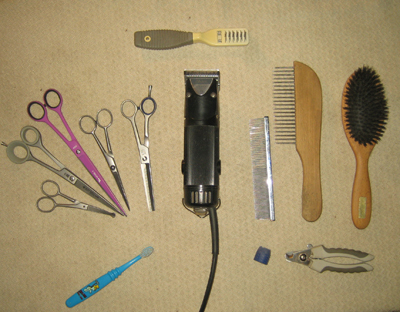 This part can be done either with electric clippers or thinning shears. The former will be shown here. Use the #10 blade (or 3 mm setting). Start at the fold on the side of the ear and clipper against the grain to just about the point where the ear is attached to the skull. Do both the outside and inside of the ear, paying extra attention to the ear canal as to not leave any long hairs obstructing the air flow into the ear. Carefully thin the transition clippered/handstripped with the thinning shears, placing them on the skin, cut upwards once, move the shears, cut, move the shears etc all the way round. Brush often to see where you need to go again. As with the ears, either electric clippers or thinning shears may be used. Locate the sternum and start there. Staying within the »rosettes« (the point where the hair turns in different directions), clipper against the grain all the way to the chin. Clipper the area from just below the cheek to the rosettes on the side of the neck (not beyond) with the grain. Pay extra attention to the lipfolds, the hair here should be very short to avoid residue of food getting stuck which will result in infections (and bad smells!). Using the same technique as around the ears, thin the rosettes to make the transition as smooth as possible. Starting at the front of the leg, handstrip all the fluff and long hairs in the same manner described above. The front and outside of the leg, from the elbow and down in a vertical line to the foot should be smooth, leaving the feathering on the back. 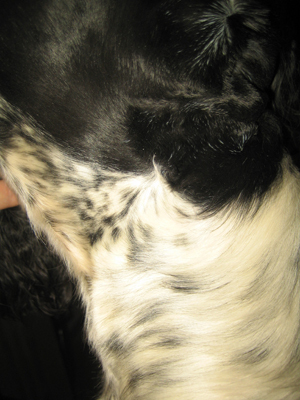 This is NOT an area in which to use thinning shears, lack of bone should be improved by breeding - not trimming! Thinning shears may be carefully used against the grain on the inside of the leg to thin the feathering. Once again, the rosettes are your landmarks. There should be feathering left on the inside of the rosettes, covering the forechest and the outside should be smoothened using the thinning shears. Follow the upperarm going in an outwards and sometimes also downwards action with the thinning shears. If the hair is very long, one could start by shortening it with the straight scissors. If desired, finish the angle using a pair of small straight scissors, making sure only to cut a little at the time as to not leave any scissor marks. The feathering is shaped using straight scissors. Start just in front of the frontlegs, holding the the scissors at the desired length of the feathering and cut inwards, move the scissors and cut again keeping the desired length and shape of the feathering constantly moving outwards to the end. This will ensure a more natural look and if done correctly, the length will be the same on both sides. A crictical eye is needed to see where you may need to go a second time.